William George Irving was born in Henley-on-Thames in 1872 and baptised there on 8 December. died soon after birth, death reg. third quarter of 1886. At the time of the 1871 census William's parents William & Ann Irbing were living in Barlow’s Yard, Henley with their first child, Annie Talbot (1), who was born before their wedding. At the time of the 1881 census William George Irving (8) was at school and living at Red Cross Yard, New Street, Henley with his father William (32), who was a brewer's labourer, his mother Ann (33), and his siblings Annie (11), Alfred (5), and Charles (3). In 1891 William (18) was working as a general labourer and living at West Hill in Henley with his parents and three of his siblings: , Alfred (15) was an errand boy, and Charles (13) and Bertie (7) were at school. His older sister Annie (21) had already married and left home. On 17 December 1892 William, aged 20 years and 3 months, signed up for a limited period with the Oxfordshire Light Infantry (service no. 4302). His service record described him as being of fresh complexion, with grey eyes and dark brown hair. He was 5′ 7″ tall and weighed 133 lb, and his chest measurement was 32½″ (34½″ expanded). He served at home from 15 December 1892 to 25 February 1894, and then in India from 26 February 1894 to 19 April 1902, fighting in the Mohmand Expedition and the Tirah Campaign. Meanwhile William’s parents continued to live in Henley, and the 1901 census specified their address as 56 West Hill. William's brothers Alfred (25) and Charles (24) had now also married and left home, so the only one of their children still living with them was Bertie (18), who was working as a bricklayer’s labourer. William served his last period in the regular army, from 19 April 1902 to 14 December 1904, on the home front. ♥ In the second quarter of 1903 in the Headington registration district, William Irving married Martha Jane Sims. She was born in Long Crendon, Buckinghamshire in 1879, and at the time of the 1901 census, when she was 21, she had been working as a servant in a hotel and was living with her parents in Old Road, Headington Quarry. Her father was a vegetable hawker. Dorothy Louisa [Margaret] Irving (born at New High Street in 1912 and baptised at All Saints’ Church on 10 March). At the time of his first child’s baptism in August 1904 William was still in the army; but when his other children were baptised in 1906 and 1912 he was described in the register as a labourer. The 1911 census shows William (38) living with his wife Martha (31) and their surviving son Victor at New High Street (probably at No. 51): he was now described more precisely as a maltster labourer, so must have worked for a brewery, as his father had done. Meanwhile his father, now a widower, was living at 33 West Hill, Henley with the family of his son Alfred. He died in 1914 at the age of 65 at Havelock Terrace, Henley and was buried at St Mary the Virgin churchyard in Henley on 4 September 1914. In 1910 New Headington became part of the new parish of Highfield, so William's daughter who was born in 1912 was baptised at All Saints' Church. He was buried at the Suez War Memorial Cemetery (Grave A.33). 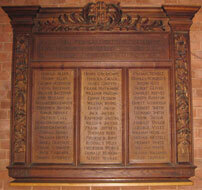 William George Irving is remembered on the Roll of Honour of All Saints’ Church, Highfield. Martha Jane Irving married her second husband Richard E. Tebby in the Oxford registration district in the fourth quarter of 1921. Victor Charles Irving married Cissie Keep in the Oxford registration district in the third quarter of 1930. He died in Oxford at the age of 84 in 1990. Dorothy Louisa Irving is probably the Dorothy L. Irving who married Alfred Yates in the Oxford registration district in the third quarter of 1935. Annie Eliza Irving (born 1870) married Arthur James Ayres at Henley on 2 August 1890. Alfred Thomas Irving (born 1876) married Alice Mary Essex in the Maidenhead district in the fourth quarter of 1898. They moved from Maidenhead to Henley in about 1900 and had the following children: Alfred William Irving (born 1898/9), Ethel Annie Irving (born 1900), Alice Lucy Irving (born 1905), Doris Elizabeth Irving (born 1906), and Leonard Frederick Irving (born 1908). Charles Henry Irving (born 1878) married Emily Kate Green in the Kingston registration district in the third quarter of 1900. National Archives WO97 / 5202 / 13 for Irving’s service record.